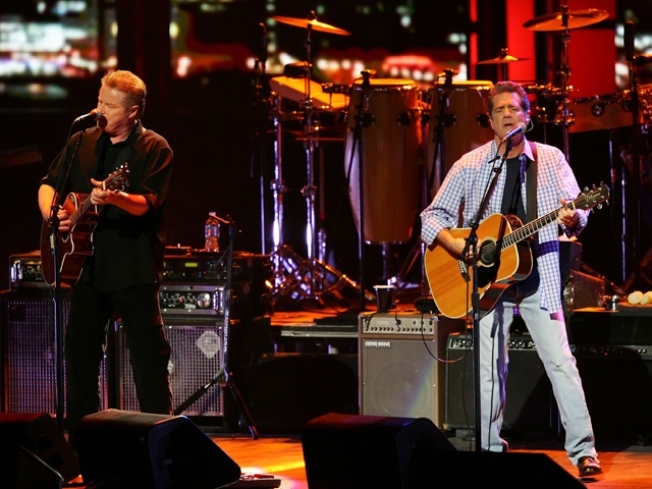 Don Henley and Glen Frey of the Eagles perform at the opening of the new NOKIA Theatre on Oct. 18, 2007, in Los Angeles. Baseball is a sure sign of summer. And so are big concerts. Put the two together and you get the Eagles at Nats Park. That's right, the rock legends are headlining a concert this June with country stars the Dixie Chicks and Keith Urban as special guests. The concert is scheduled for June 15. Tickets go on sale March 29. The Eagles -- Glenn Frey, Don Henley, Joe Walsh and Timothy B. Schmit -- are expected to perform hits from their 35-year-plus career, including favorites "Hotel California," "Desperado," "Life in the Fast Lane," "Take It to the Limit" and more. The Eagles last performed in Washington in 2008. The Dixie Chicks hit the stage for the first time in four years. They are the biggest selling female group in history. And country/pop star Keith Urban is a fan favorite as well. He is a three time Grammy Award winner who's sold almost 15 million albums worldwide. According to the Nationals' Web site, the event will use all-In ticketing, allowing fans to purchase tickets without any fees and streamlines the ticket buying process. The Eagles are also offering the ultimate fan experience for the DC concert with VIP ticket packages. For details go to www.iloveallacess.com.